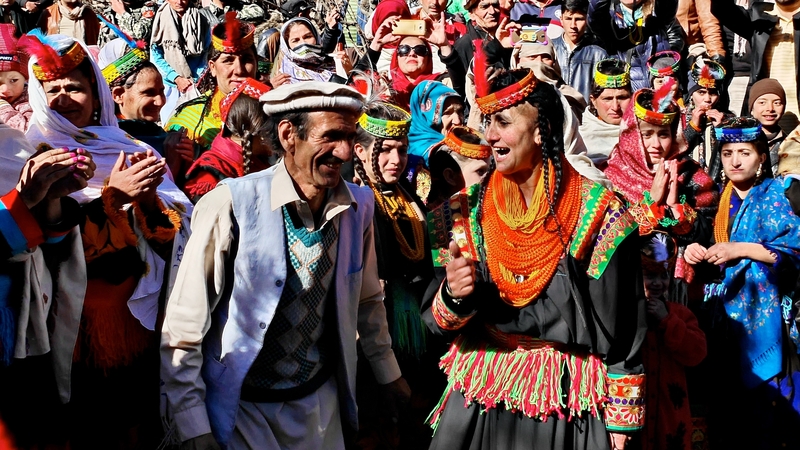 Chitral with the unique Kailash Valley (known as the Wearers of Black Robes) – a remaining minority of approximately 3500 people living in three isolated but beautiful valleys known as Bumburet, Rambur and Berir. 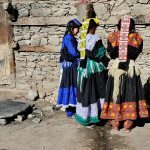 The people of Kailash have a rich culture and are very strong footed about their identity. These people stand out from the remaining tribes, cultures and communities due to their distinct traditions, religious practices and festivals. The Kailash Valley boosts serene beauty, lush green valleys and fruit farms making it an ideal tourist spot not only in terms of scenic beauty but also cultural diversity and festivals/ceremonies. Drive to Swat, a land that shines with fruit-laden orchards, flower-filled slopes, meandering rivers, tumbling streams and is surrounded by the mighty ranges of the Hindu Kush and the Karakoram. The valley is 3250 feet above sea level and Saidu Sharif and Mingora are the towns that form the twin capital of this area. Day 3: Full day exploring the archeological sites of Swat. We shall be visiting the most important sites in the area although there are hundreds of sites having equal importance. The Buddhist sacred precinct of Bukhara identified as the monastery of Ta-Lo, mentioned by Sung Yun (520 AD) visited and described by the Chinese Buddhist pilgrims of the 5th, 6th and 7th centuries AC lies at the eastern end of the ancient capital of Udyana Meng-Chich-Li, present Mingawara. The main Stupa stands in the middle, around it are crowded monuments Stupas, Viharas and columns, on the Northern side stands a great building and further to the north and west the inhabited area. The Great Stupa under event five reconstruction, each new one incasing the older from 3rd century B.C down to 10th century A.D.
We will try to visit maximum sites as some of them are below mentioned. Drive to Chitral, an isolated valley among the Hindu Kush mountains, a small valley that is overshadowed by the Trichmir Mountain, 25,230 feet high, and divided into two sub-sections by the rapid flowing Mastuj River. The city acts as a base for many trekking and hiking expeditions, and its pure mountain air attracts many who wish to relax. The Kafir valleys provide an interesting diversion for the locals consider the Kafirs as heathen and totally unacceptable, for they are unbelievers. The hot sulphur springs close to the city are well known for their healing abilities and attract a good many who wish to be cured from varied ailments ranging from migraines to sterility. Overnight at hotel. 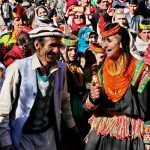 The Kailash, are a Dardic indigenous people residing in the Chitral District of Khyber-Pakhtunkhwa province of Pakistan. 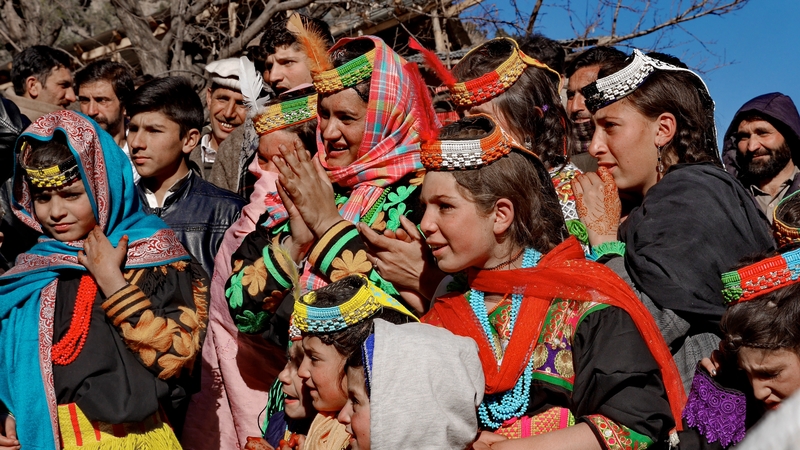 They speak the Kailasha language, from the Dardic family of the Indo-Aryan branch, and are considered a unique tribe among the Indo-Aryan peoples of Pakistan. 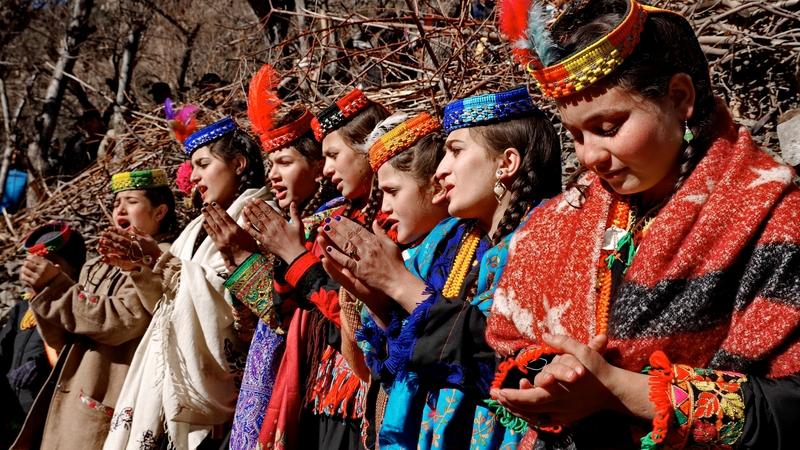 The neighboring Nuristani people of the adjacent Nuristan (historically known as Kafiristan) province of Afghanistan once practiced the same polytheistic religion as the Kailash. 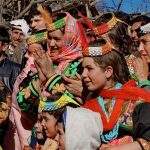 By the late 19th century much of Nuristan had been converted to Islam, although some evidence has shown the people continued to practice their customs. 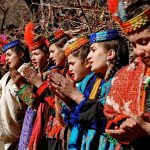 Over the years, the Nuristan region has also been the site of numerous war activities that has led to the death of many endemic Nuristanis and has seen an inflow of surrounding Afghans to claim the vacant region, who have since admixed with the remaining natives. The people of Kailash have maintained their own separate cultural and traditions even today. Overnight in hotel. We have full day to discover the peculiar culture of Kailash valley. The three valleys of Birir, Bumburet and Rumber are on the edge of the monsoon belt, so the vegetation is dense, with giant walnut trees and fruit trees draped in grapevines overhanging swiftly flowing streams, Fields on the valley floor grow wheat, barely vegetables and fodder, and the steep 3000m ridges between the valleys are clothed in evergreen forest right to the top. Bumburet is the largest and most commercialized of the tree Kailash valleys. 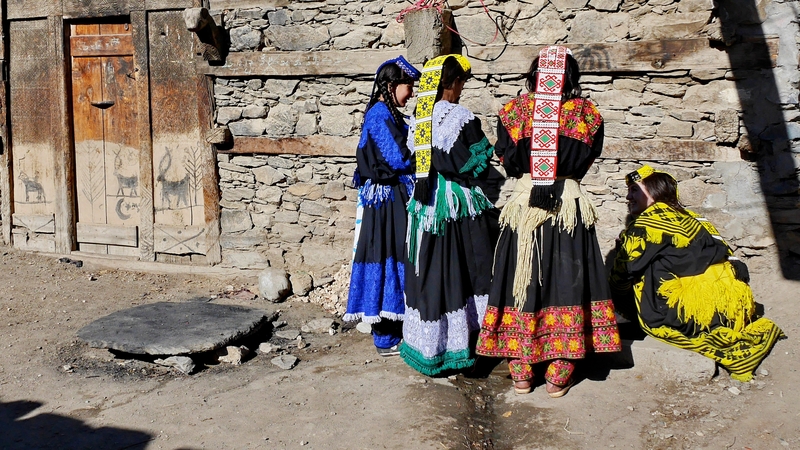 The people of Kailash have maintained their own separate cultural and traditions even today. Drive to Peshawar en-route visit to Takht-e-Bhai, the Buddhist monastic complex of Takht-i-Bahi (Throne of Origins) is situated on top of a 152 m high hill, about 80 km from Peshawar and 16 km north-west of the city of Mardan. It was founded in the early 1st century AD, and was successively occupied and expanded from that time until it fell into disuse through the discontinuation of charitable endowments in modern times. Owing to its location on the crest of a hill, it escaped the invasions of the Huns and other antagonistic peoples, leaving it today with much of its original character intact. The name Takht-i-Bahi derives from the spring on the hilltop and is literally translated as ‘Spring Throne’. Later drive to Peshawar, the capital of Khyber Pakhtunkhwa (formerly known as the North-West Frontier Province), and the administrative centre and economic hub for the Federally Administered Tribal Areas of Pakistan. Peshawar is situated in a large valley near the eastern end of the Khyber Pass, close to the Pak-Afghan border. Known as “City on the Frontier”, Peshawar’s strategic location on the crossroads of Central Asia and South Asia has made it one of the most culturally vibrant and lively cities in the greater region. Peshawar is irrigated by various canals of the Kabul River and by its right tributary, the Bara River. Peshawar has now evolved into one of Pakistan’s most ethnically and linguistically diverse cities. Overnight in hotel. Peshawar Museum was built in 1906-07 in the memory of Queen Victoria. The two-story building features an amalgamation of British, South Asian, Hindu, Buddhist and Mughal Islamic architectural styles. The Peshawar Museum has the most important and largest collection of Ghandhara Art in the world. The Buddha life story in stone is beautifully carved with all details You can find there different types of the relic caskes, stupa, models of schist and bronze along with life size Bhudda Statues, skillfully carved and beautifully balanced masterpieces of Ghandhara Art. There is also very impressive bras statue of Queen Victoria seating on the throne. Mahabar Khan’s Mosque the only Mughal era mosque in Peshawar which survived the depredations of the Sikhs, though the Top domes of the minaars were destroyed by the Sikh rulers, which were later on rebuilt by Britishers. It was built in the seventeenth century (1670 AD) and it is named after Mahabat Khan Mirza Lerharsib who twice governed Peshawar under Shah Jahan and Aurangzeb. It is a classic example of Mughal architecture with a central open courtyard and a prayer hall covered by the three fluted domes. Adjacent to the entrance to the mosque, an ancient doorway leads into a large courtyard surrounded by a three storey gallery. You can climb to the roof of this three storied complex to get a superb view down into the courtyard of the mosque. Its open courtyard has an ablution pool in the middle and a single row of rooms around the sides. The prayer hall occupies the west side flanked by two tall minarets. The interior of the prayer hall is sheltered beneath three low fluted domes and is beautifully painted with various floral and geometric designs. It is worthy visiting place in Peshawar especially for the ones having interest in Mughul Architecture. Extending from west to east in the heart of the city is the romantic ‘Street of Story-tellers’ – the Qissa Khawani Bazaar. In olden days, this was the site of camping ground for caravans and military adventures, where professional story-tellers recited ballads and tales of war and love to throngs of traders and soldiers. Today the story-tellers are gone but the atmosphere lingers on. Bearded tribesmen bargain with city traders over endless cups of green tea. Fruit stalls look small colourful pyramids. Overnight in hotel. Drive to Islamabad en-route visit to Taxila museum we visit Taxila Museum and Julian. Steeped deep in history, the excavations at Taxila take you back 2,500 years into the world of Buddha, Alexander, Asoka and of course the Emperor Kanishka whose imprints are visible to this day. It is here that you find endless images of Buddha. You find these in stone and in stucco. Important stages of Buddha’s life are depicted in the numerous panels that have been uncovered here. This great man of peace is depicted in exquisitely carved sculptures and statues glorifying him and his life. Each one of these sculptures is a collector’s pride. Later drive to Islamabad for overnight in hotel.